The Peasant Ensemble is made of faux suede and has an A-line shape appearance. The bodice is made with faux suede very smooth in texture. The front is held together by laces and has fish bone inserts. The chemise is standard cotton. We offer this ensemble in a variety of different colors. 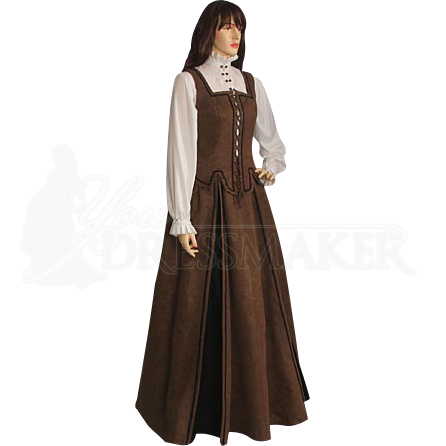 The Brown Peasant Ensemble is great for Renaissance Fairs, Medieval weddings and Medieval re-enactments. Be the highlight of your next fair or event with this beautiful Brown Peasant Ensemble.